8, Jalan TP 3/1, Taman Perindustrian Sime UEP, 47600 Subang Jaya, Selangor, Malaysia. 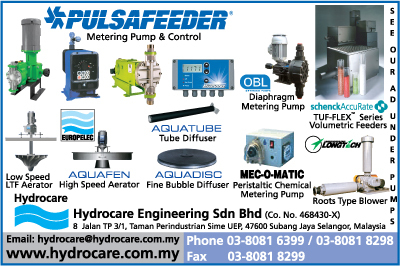 Hydrocare Engineering Sdn Bhd ("Hydrocare") is a representative and distributor of a broad range of quality fluid handling equipment that are manufactured by world-class manufacturers. The overseas principals of Hydrocare, namely Pulsafeeder, Inc., USA, SCHENCK AccuRate, Inc., USA, and LONGTECH Machinery Industry Co., Ltd, Taiwan, are internationally renowned manufacturers of metering pumps, volumetric feeders, roots blowers / vacuum pumps respectively.